Who doesn’t like speeding down a track? Hugging the turns, cutting off your opponents, and getting first place? It’s what any racing game tries to capture. Does Moto Racing GP capture the excitement? Short answer: A bit. 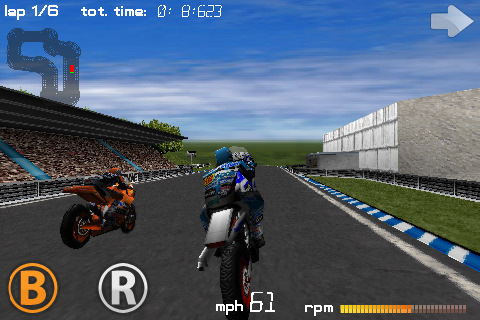 Moto Racing GP is a motorbike racing game for the iPhone, iPod touch, and iPad. Released by Darxun Games for $0.99. Moto Racing GP presents you with 4 tracks, 4 bikes, and 3 difficulty levels. Tracks have alright graphics, though it really looks like a PSX game with low resolution textures and empty fields. Each bike looks alright, though the statistical differences are minor at best. I do like the outdate graphics for their resemblance to my childhood games, but it does feel lacking when compared to games like Monster Trucks Nitro or Fast & Furious, both of which are vehicle games that look rich and detailed. The controls are the most difficult to get used to. Steering requires you tilt the iDevice in the direction you want to go. When driving quickly down a path and you come across a tight turn, not only do you have to lower your speed, but tilting the phone makes –seeing- the track difficult. There are little catch-areas in the tracks that, if you don’t turn correctly, will block your way and cause you to bounce very hard against the wall. This will stop you dead in your tracks and force you to accelerate slowly back into the race. You can press the R button to reset you back onto the track, but then it’s already way too late to come back. I’ve been lapped several times during a single race, and that should never happen unless you are deliberately slamming into walls. The enemy AI never crash. They will turn at top speed and make the race near impossible to win once you crash once. It’s challenging to just steer so the combination of catching a wall and stopping dead in your tracks with the opponents turning perfectly, it makes the game nearly impossible to master. This is far from my first time playing a racing game, but I couldn’t win more than one single time. I played over 50 times (not joking) and become incredibly frustrated. I wish there was more to the game. At $2, I want to see more control options, more tracks, more bikes with noticeable differences, and more additions to the graphics. The racing engine for the gameplay has set up a nice skeleton, but the muscles, organs, and skin have to be built better. Looking forward to seeing a serious update. I’m sure some of you are far superior at steering and racing in this game. If that is the case, you will find this game to be playable but lacking in features and variety. AppSafari review of Moto Racing GP was written by Joseph Ho on September 26th, 2010 and categorized under App Store, Games, Racing. Page viewed 4292 times, 1 so far today. Need help on using these apps? Please read the Help Page.